At the WP Learning Center we get several requests for information on how to update WordPress websites, plugins, and themes. We know that sometimes it can be tricky to update these without knowing where to start or the steps you need to take in order to update your WordPress site. In this newsletter, we’ll take you through the updating process step-by-step for updating your WordPress version, your plugins, and your themes. We also recommend that you backup your database and content through any tools that are provided through your hosting account. After you backup your WordPress website, the next thing that you will want to update are your plugins. From time to time, updating a plugin can adversely affect your website. You want to be sure to update only one plugin at a time so you’ll be able to tell which plugin affected your site. Plugins also need to be checked regularly – about two times per week – to ensure that everything is up to date. Here are the steps to updating your WordPress plugins. Step 1: Google each specific plugin to see if there are any known issues with it and to find out the latest version and see how far away your version is to the newest one and check on compatibility issues. Step 2: Access your plugins and see if they need to be updated. Go to the left side panel and click on the plugins tab. If there are any plugins that need to be updated, there will be a red circle underneath each plugin. There will be an “Update Now” link that you will want to click and then follow the on-screen prompts and directions to update each plugin to its new version. Step 3. After each plugin is updated, check your live website. If it has been corrupted in any way, you now know what plugin is the culprit. A message on your dashboard may also be displayed, alerting you that you have plugins to update. This message will have a link in it that will direct you to download the newest version of the plugin. Follow the steps to download the new version of the plugin. Next, update your WordPress version. There are two ways to update your site. One-click updating is the easiest and works for the majority of people. Manually updating your WordPress version is going to be more hands-on and will have more steps involved. If you’re updating from a very old version of WordPress we highly recommend that you check your theme and your plugins to make sure that it supports the latest version of WordPress. Otherwise, you may have critical issues after updating. The first step that you will want to take is to Google your WordPress version to see if there are any known issues with it and to find out the latest version. You’ll want to see how far away your version is to the newest one and check on compatibility issues. Step 1: To start the update of your WordPress version, simply click the link in the new version banner. If the banner is not there, you can go to the Dashboard and then click “Updates” to go to the updates page. Once you reach the “Update WordPress” page, you’ll want to click the “Update Now” button. After this, you shouldn’t have to do anything else. Once the update has completed, you’ll want to go to your website and make sure that it is fully functional. If one-click updating does not work, don’t fret! You can always manually update your WordPress version by following the steps below. Step 1: Download the most recent WordPress version zip file and unzip that file. Step 2: Deactivate your plugins by going to the plugins screen and clicking “Deactivate” for each plugin that you have. Step 3: Through your FTP or shell access, delete the old “wp-includes” and “wp-admin” directories on your web host. Step 4: Using the same FTP/shell access, upload the new “wp-includes” and “wp-admin” directories on your web host in place of the old ones. Step 5: Upload the individual files from the new “wp-content” folder to your existing “wp-content” folder and overwrite the existing files. Do NOT delete your existing “wp-content” folder. Do NOT delete any files or folders in your existing “wp-content” directory (except for the one being overwritten by new files). Step 6: Upload all of your new loose files from the root directory of the new version to your existing wordpress root directory. Be careful when you are copying and replacing anything in the “wp-content” directory and make sure you don’t replace your entire “wp-content” directory since this is where your themes and plugins are. You should also be sure to look at your “wp-config-sample.php” file to see if there are any new settings that you would like to add to your own “wp-config.php” file. If you’ve updated manually due to not being able to one-click update, you will want to delete the “.maintenance” file from your WordPress directory using FTP, as this will remove the “failed update” message. Step 7: Go to your main WordPress admin page by adding “/wp-admin” to the end of your URL and login if prompted to do so. If there is a database update, WordPress will give you a link. Follow the link and the instructions. Doing this will make it so your database will be compatible with the newest code. Make sure to do this right after Step 6. Step 8: This is the point where you will want to clear your cache so the changes to your WordPress website will go live immediately. Step 9: Now that your WordPress website is updated, you can go back in to your plugins screen and reactivate your plugins. If, after you update, you experience login issues, try clearing your browser’s cookies. Now that you have updated your plugins and your WordPress version, the final step in safely updating your WordPress website is to update your theme. We highly recommend that you purchase your own theme so you have a direct line of communication between yourself and the theme maker in case any issues come up. Like with updating your WordPress version, there are going be to be a few different ways that you can update your WordPress theme. One way is through automatic updates and the other is manually updating your theme. Automatic Theme Update: There are a few ways this can be done. 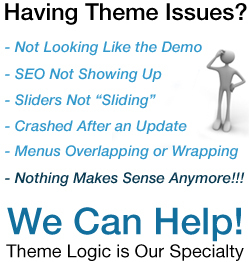 Method 1: Go to your WordPress Dashboard and then go to Appearance, then Themes. The themes that have available updates will show an alert banner. Simply click on the theme you want to update and then click the “Update Now” link. Method 2: Go to your WordPress Dashboard and then go to Dashboard, then Updates. Again, the themes that have available updates will be shown. Simply click on the theme you want to update and then click the “Update Now” link. Manual Theme Update: If you bought your own premium theme, and have the zip file of your theme and child theme, this is an optional way to update. Some theme providers require that you update in this way. Step 1: Login to your WordPress site using FTP or cPanel and go to “wp-content/theme” and go to your theme’s folder. Step 2: Rename the old version of your theme. Rename it to something like “theme-old”. Step 3: Upload your new theme. Both the old and new versions of the theme will appear in the themes place, but you will be able to distinguish them by their folder names and version numbers. After going through these steps, your WordPress version, plugins, and themes should now be safely updated. If you need further support for updating your WordPress website, we can schedule time with an instructor to help you and guide you through the process. You can reach us by phone at (512) 593-1621 or by email at rick@wordpresslearningcenter.com.